Fill in your details below and we will let you know within 24 hours if we can get Arraial to you with haste! "Arraial" is the name given to traditional Portuguese summer celebrations during which people take to the streets eating, drinking, and having fun in the old neighborhoods that are bedecked with arches, colorful balloons, popular music, and the aroma of sweet basil. In the game Arraial, players try to make their neighborhood traditional event the most popular by attracting visitors to their celebration. Grab the most beautiful decorations, hire the most inspired performers, serve the most traditional delicacies, take to the streets, and host the party of the year! 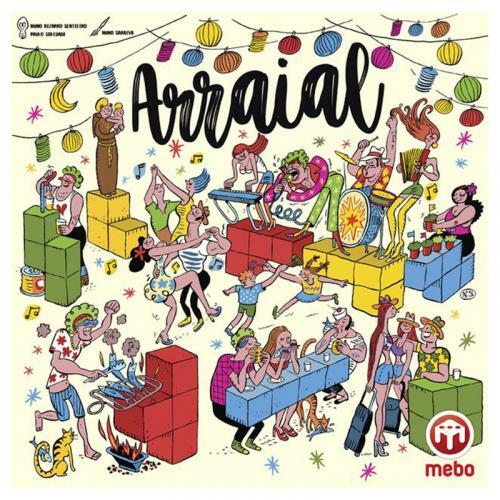 Arraial is a fast-paced tile-laying game in which players take turns placing tiles in their neighborhood in Tetris-like patterns that fit perfectly with the previous placed tiles, trying to create a diverse party and compete to attract visitors to their neighborhood! The unique rotating central board means your position at the table will have an impact on gameplay!